Linked directly to the mall’s famed Fashion Avenue, Address Dubai Mall now welcomes visitors in a new look and sparkle. 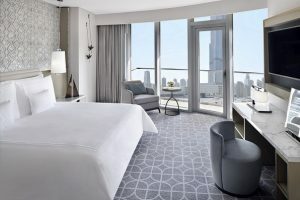 Emaar Hospitality Group, the hospitality and leisure business of global developer Emaar Properties, has boldly reimagined the hotel, an exceptional and exclusive city shopping retreat in The Dubai Mall. The rooms take on an inspiring new look and feel with lavish furnishings. Private balconies open to mesmeric views of Burj Khalifa and The Dubai Fountain. Karat, the lobby lounge, is fresher and sophisticated, and serves contemporary and modern Arabic culinary delights. Cez is where you can retreat for a sumptuous lunch. The Café serves luscious lattes to ice-cold frappés. Opening soon is the Club Lounge, exclusively reserved for guests of Club Rooms and Suites. Address Dubai Mall is also home to one of the largest open-air lap pools in Downtown Dubai, its allure enhanced by the exotic pool-side restaurant, Cabana, which will welcome guests shortly. 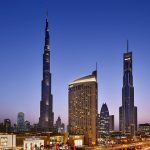 Adding to the choice of Address Dubai Mall as one of Dubai’s definitive wedding venues is a Bridal Sales Centre, that serves as a preview showcase, and a VIP multi-purpose room. The Spa at Address Dubai Mall has an elegant new look and assures the blissful experiences of refinement and rejuvenation that nourish both mind and body.